Celebrate the abundance of fruit with this delicious combination of ripe refreshing delights! 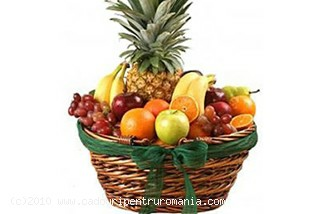 Send an entire orchard of fruits in a classy gift basket and it is sure to delight and satisfy the cravings of anyone. It will fill their Christmas holidays with flavour and joy! 7.Methods of payment accepted by Send Gifts To Romania: Send Gifts To Romania accept: payment by credit card / debit card, through Paypal, MoneyGram or Western Union.